There are few continents where olive oil is produced that have not benefitted from Leandro Ravetti’s expertise. 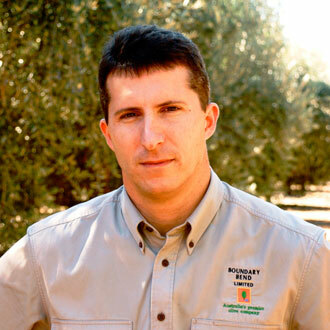 A native of Argentina, he has studied and worked around the world to promote best orchard practices for olive oil. Armed with an advanced engineering degree from the National University of Catamarca in Argentina, he completed studies in both Italy and Spain before embarking on a globe-trotting career. As Technical Director of Modern Olives in Australia for the past 10 years, he has been leading the team that provides technical advice to some of the largest olive projects in Australia and other new world olive countries such as Argentina, Peru, South Africa and the United States. His research activities have been focused on grove design, management and mechanization, olive variety evaluation, pollination studies and determining optimal harvesting period for specific varieties. In recent times, Leandro has had extensive experience with the development of mechanical harvesting and pruning in large-scale modern olive groves. Most recently, Leandro has been Executive Director of Boundary Bend Limited, Australia’s leading fully integrated olive company since 2005 and alternate Director of the Australian Olive Association since 2009. The industry can also thank Ravetti for his sizable contribution as Drafting Leader to the newly adopted Australian Standard for Olive Oil. In other words, Leandro’s life is a bit of a contradiction. He may well be the most travelled expert of a discipline that is most closely tied to the land. But it is all the result of Ravetti’s reputation as one of the world’s most qualified and experienced advisors dedicated to creating the best olive oil possible. Half way through my degree in Argentina, I knew that I wanted to be involved with fruit tree production. With the olive industry in Argentina just beginning to boom, it was a natural progression to begin a career in that industry and, as soon as you start working with olives, it is impossible not to fall in love with the tree, the oil and the wonderful history and traditions behind them. Without a doubt, the misleading labeling practices such as calling chemically rectified olive oil Pure or Extra Light; the widespread adulteration of olive oil with cheaper oils; and the extensive contamination of extra virgin olive oil with deodorized (soft refined) olive oil are the greatest challenges the industry faces. These issues not only affect consumers who pay good money for an inferior product, but also hurt honest growers and producers by distorting supply and threatening the financial sustainability of the entire global industry. The aroma and taste of freshly produced new season extra virgin olive oil. If every potential consumer of olive oil had the opportunity to taste this wonderful product, they wouldn’t go back to old, refined or poor quality oils. As the trees in the Southern Hemisphere start to bud up, our technical team prepares for another exciting season. While irrigation scheduling, fertilization management, pruning and harvest planning for our groves are my everyday priorities, I manage to squeeze in some other very interesting activities such as technical presentations, consultancy work and collaboration with the Australian Olive Association to promote the adoption of the recently published Australian Standard on Olive Oil. I promised my wife that we would go back to Italy, and Florence, in particular. She deserves it for being such a wonderful person, for her unconditional support and for putting up with me and my ‘olive affair’ for more than 20 years! Integrity and commitment. I am very fortunate to work with people like Rob McGavin, Paul Riordan and a team at Boundary Bend that I truly respect for being great examples of these qualities. Homemade pasta cooked to perfection, fresh truffle shavings and a fantastic new season extra virgin olive oil. This is a very simple dish that brings out the best of each of its ingredients. Catamarca in Argentina. I don’t think that my hometown tops too many “100-places to visit before you die” lists. It is unbearable hot in summer and terribly windy and dusty in spring. However, between its beautiful mountains I have family, friends and lots of great memories that make it my favorite place on Earth. I am very lucky that I manage to spend some time there a couple of times a year. My most satisfying achievement is having been part of a wonderful team that in little less than a decade took a few young trees planted in a remote area of Australia and turned them into one of the largest fully vertically integrated olive companies in the world. By doing this, we demonstrated that it is perfectly possible to achieve high yields, efficient costs of production and excellent quality all at the same time. What made this process even more satisfying was the peer recognition we gained along the way as true leaders in this new olive world. Boundary Bend Olives has twice won the Australian Olive Association Olive Grower of the Year Award, together with a number of prestigious awards including the Governor of Victoria Agribusiness Exporter of the year; the NAB Agribusiness Awards for Excellence in Export and for Innovation in New and Emerging Industries; and the Australian Government Agribusiness exporter of the year. In addition, our flagship retail brand, Cobram Estate, has won hundreds of medals in national and international competitions, including being recognized as the best olive oil in Australia in 2009. Most recently, we received 2 of the 3 trophies for best in show in the prestigious 2011 LA County Fair awards where we competed with the best that the olive oil world has to offer. A memorable meal is all about the moment and the people that you are sharing it with. Working with olives, I have been lucky to enjoy many excellent meals in many places with great people but the one that I can think about right now has nothing to do with work. I was having a 1-scoop strawberry ice-cream (it had to be pink) with my 3-year old niece Catalina. As she was enjoying the treat, she smiled at me and said…. “I love you uncle”! There is no doubt that there have been a lot of changes in the olive oil industry in recent years including the emergence of New World producers; the globalization of olive oil consumption; and the recognition of extra virgin as being the truly natural, fresh and flavoursome juice of the olive. As these trends continue to gain momentum, I am looking forward to continuing to play a part in this exciting process and ensuring that consumers in Australia and around the world have the opportunity to enjoy one of the world’s greatest natural products!